The song appears on the Achtung Baby album. 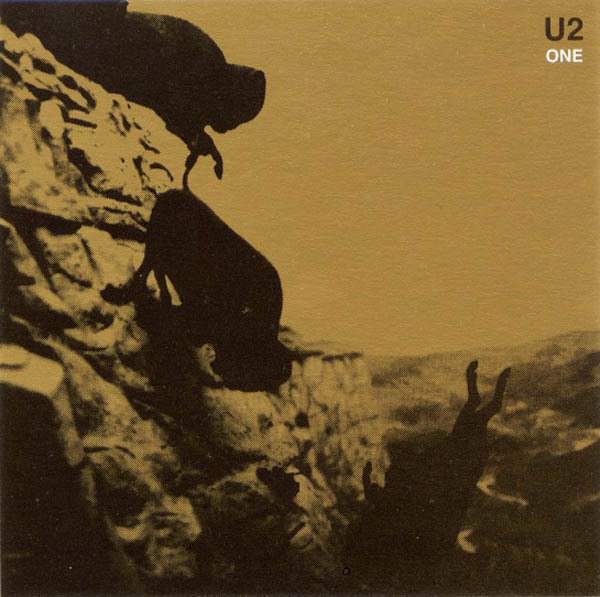 All royalties from this single went to AIDS Research and the cover, of buffaloes falling over a cliff, was a photograph by artist David Wojnarowicz. The b-side included a cover of Lou Reed's Satellite of Love featuring background vocals by Gavin Friday. U2 premiered the song for the first time on February 27, 1992 in Lakeland, Florida while rehearsing for the upcoming Zoo-TV tour. The performance was broadcast that same evening on Top of the Pops. Adam and Larry joined Michael Stipe and Mike Mills of REM for an acoustic performance of One at the MTV Rock & Roll Inaugural Ball on January 20, 1993. They billed themselves as Automatic Baby. Violinist Jo Shankar and percussionist Stefan Rager joined Bono and The Edge for a performance of One at the Festival Against Racism in Hamburg, Germany on January 31, 1993. Bono, The Edge, and Brian Eno as Passengers performed an orchestral version at the Pavarotti and Friends: Together For The Children of Bosnia in Modena, Italy on September 12, 1995 to benefit the War Child charity. It was also one of 5 songs played when U2 performed at the Tibetan Freedom Concert on June 8, 1997 on Randall's Island, New York. A 3-CD enhanced set for this concert was released featuring U2 performing One and an interview with Bono. The Tea Party performed the song live and Robbie Williams when he headlined the Slane Festival in 1999. Bono, accompanied by Zucchero, performed One for the NetAid concert at Giant's Stadium on October 9, 1999 to raise money and awareness for the Drop The Debt campaign. Bono and Daniel Lanois performed an acoustic version on the steps of the Lincoln Memorial to celebrate America's Millennium Gala. U2 performed the song live when they received the Freedom of City award. A medley of One/Unchained Melody from the November 27, 1993 Sydney concert appeared on Hold On/The BBC Radio 1 FM Sessions. Many artists have recorded a version of One including: Information Society on We Will Follow: A Tribute to U2; the Royal Philharmonic Orchestra on Pride:The RPO Plays U2; Straitjackets on Zoovenir-A Tribute to U2; and Studio 99 on The Best of U2-A Tribute. British soul singer Mica Paris also released a cover of One featuring several remixes.